Throughout the country, throughout the world, there are Irish communities where the traditions and culture lives on. And so much has to do with the music and the dance. In the Twin Cities of Minneapolis and St. Paul in Minnesota, there is a thriving Irish scene and one of the reasons for its authenticity and strength is Martin McHugh. 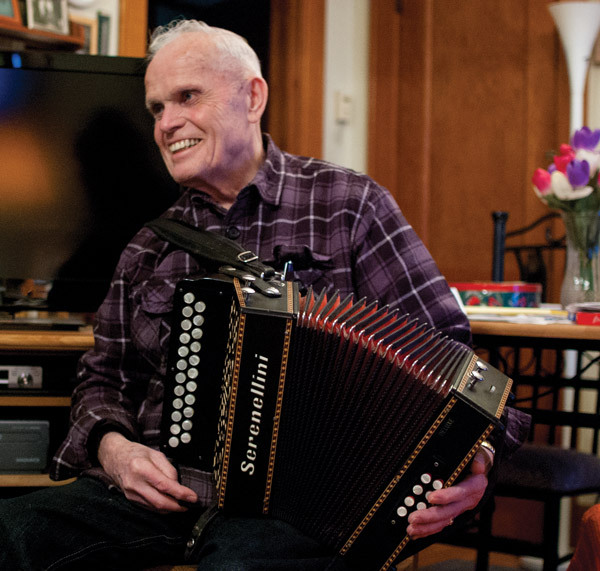 A long-­time resident of the area, the Roscommon accordion player has played music there for decades and now has an album that people from all over can enjoy. The first thing that strikes me about the CD is how easy it is to dance to. The rhythms are perfect, the melodies encouraging. It’s tough to sit and listen when your body aches to move with the tunes. His fluid style is attractive, especially with the strong, yet unimposing guitar accompaniment of Daithi Sproule. Amongst the 16 tracks are five sets of reels, two hornpipes, four jigs, one slide, a polka and two waltzes and an air. There’s also one song by Sproule. And here and there is Laura MacKenzie on flute, whistle and concertina. There is a lot of variety among the tracks, but unifying the whole sound is a feeling of days gone by. McHugh is an expert musician with a great feel for both his instrument and the tunes. And it’s always a pleasure to hear Daithi Sproule sing – “Mo Theaghlach” is a delightful waltz, introduced by accordion, leading on to the vocal, before flowing into “My Eileen Is Waiting For Me”.